Don’t try to fake it…Fogle it! Fogle’s Asphalt Sealing offers high quality driveway sealcoating and driveway sealing with crack sealing. A sealcoat is a protective layer applied to a non-highway asphalt surface to shield it from damaging elements such as sun, rain, snow and automobile fluids. It also has many other benefits while adding beauty and value to your home. Give us a call for your FREE ESTIMATE today! A well-marked parking lot is an important feature of any property. 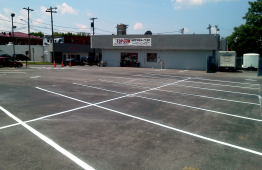 A well-marked parking lot can attract customers, facilitate traffic flow and increase pedestrian safety. Fogle’s can repaint existing lines, or layout a new lot. We can provide all types of pavement markings to include Handicap markings, arrows to aide traffic flow, or any custom markings your property requires. First impressions are very important. Your parking lot is the gateway to your business. All visitors, employees and customers pass through here on the way in and once on the way back out again. A nice coat of black sealcoat and the contrasting parking lines will not only improve your property’s curb appeal; it can save you tens, or even hundreds of thousands of dollars by prolonging the life of the pavement surface. Give Fogle’s a call today for your FREE ESTIMATE. 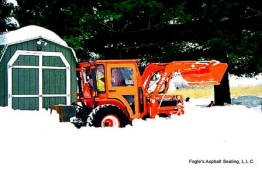 Fogle’s Asphalt offers reliable snow plowing services for commercial clients in Frederick County, MD. Why trust your multi-thousand dollar parking lot to a landscape company? 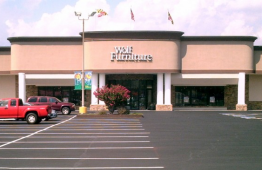 Fogle’s knows asphalt and will treat your commercial parking lot in Frederick, MD with consideration and care while plowing and removing snow and ice. We can also salt your lot while plowing to help melt ice, keeping your employees and customers safe. 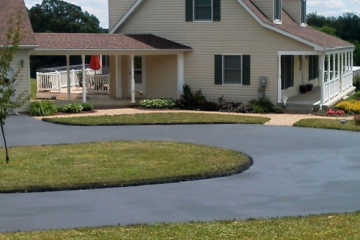 Do you need Commercial or Residential Asphalt Sealing in Frederick, Md? Fogle's Asphalt & Sealing has been specializing in the highest quality residential & commercial asphalt sealing, driveway sealing, crack filling and line striping in Frederick, MD and surrounding areas since 1963. We take pride in full customer satisfaction in each and every job. Fogle’s has a valid MHIC License #126255 and an A+ rating with the BBB. We are proud of our reputation we have built for honest, quality workmanship, and complete every asphalt sealing, line striping, driveway paving, and snow removal jobs with integrity. We are driven by a sincere desire to make each and every customer happy by listening to our clients needs and giving attention to the details in every job. Using the highest quality products and equipment, and staying true to our principles ensures a successfully completed job. Before you spend your hard-earned money on a contractor, check references. Fogle’s has a valid MHIC License #126255 and an A+ rating with the BBB. In this business, there are plenty of people running around in a truck knocking on doors, offering low, low prices, and pressuring you to make an on-the-spot decision. Many of these people who knock on your door significantly water-down their sealer. Unless you are one of our previous customers, you will not see us come knocking on your door, begging for your business. Reputable contractors do not need to go knocking on doors! Moreover, we will never pressure you for an on-the-spot decision. However, if you see us working in your neighborhood, please stop by and say “Hi!” We would love to meet you! Fogle's is committed to using high quality products and providing the best possibly service every step of the way. We will work around your schedule to minimize any disruption to your home or business and are strive for complete satisfaction. Give us a call today to learn more about our driveway or parking lot sealing, line striping, and snow removal services You'll be glad you did! I have used Fogle's Aspahlt Sealing in Frederick, Maryland two times in the past 8 years for residential driveway sealing services. 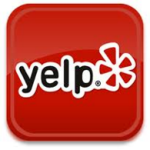 I have been very pleased with Carl's professionalism and good service. I would highly recommend Fogle's Asphalt Sealing to anyone in Frederick who needs to seal their driveway or commercial parking lot. Kenny D.